Soul of Asia - Seoul is indeed a worth-visiting city, worth remembering, and worth living. This is the city that has the charms coming from many different aspects and makes a traveler like me really want to come back here again. 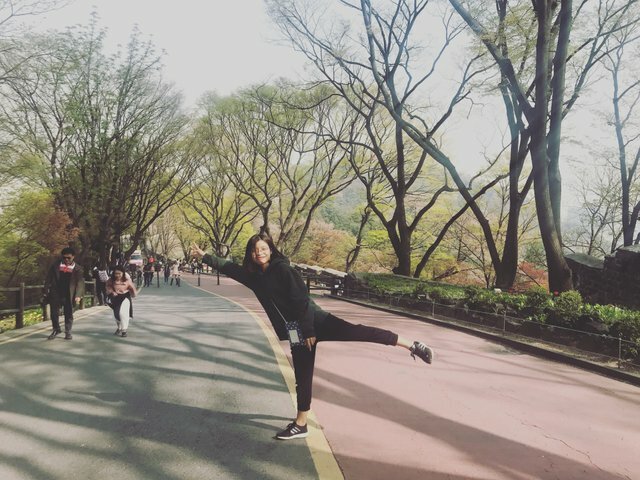 In the previous post, I suggested 3 historical places that you should visit in Seoul: Bukchon Hanok Ancient Village, Gyeongbokgung Palace and Gwanghwamun Square. The historic beauty of Seoul is definitely something not to be missed but it's not all about this city. All of it is what I'm going to tell you bellow. 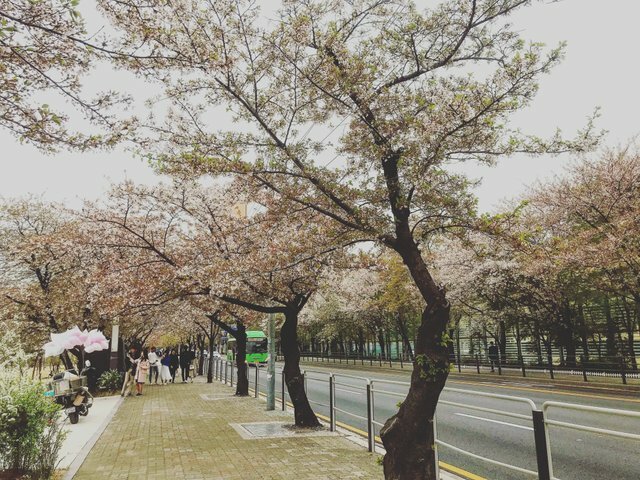 I visited Seoul in April, when the weather was in the late spring, and also at the end of the cherry blossom season. 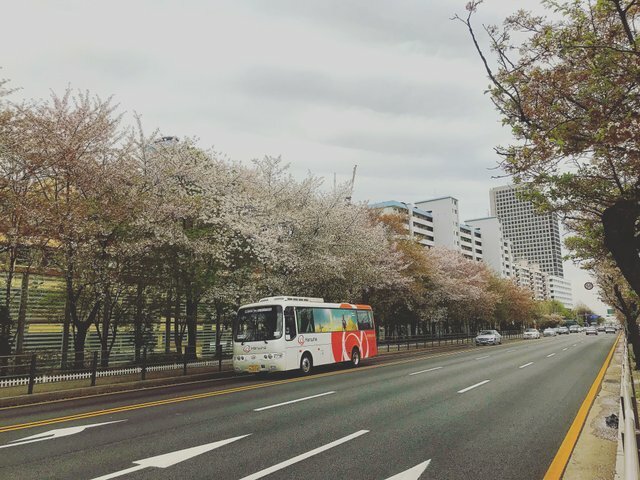 Han River is the place where I definitely have to visit because it is one of the most ideal places for admiring cherry blossoms at the end of the season. 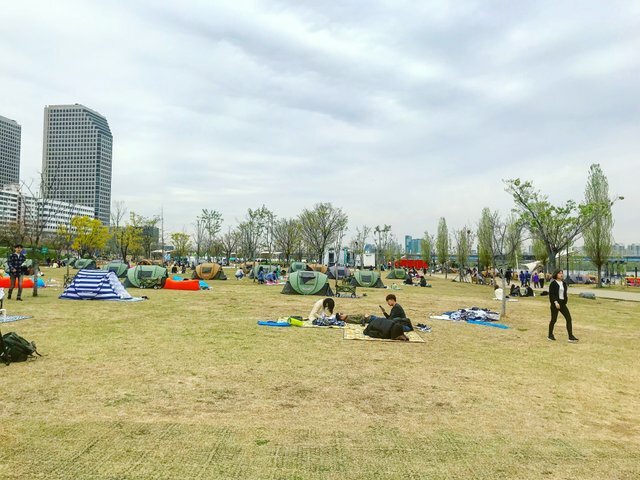 As a symbol of the city, the Han River is the place gathering many residents, especially young people coming here to camp, stroll, relax and do recreational activities. 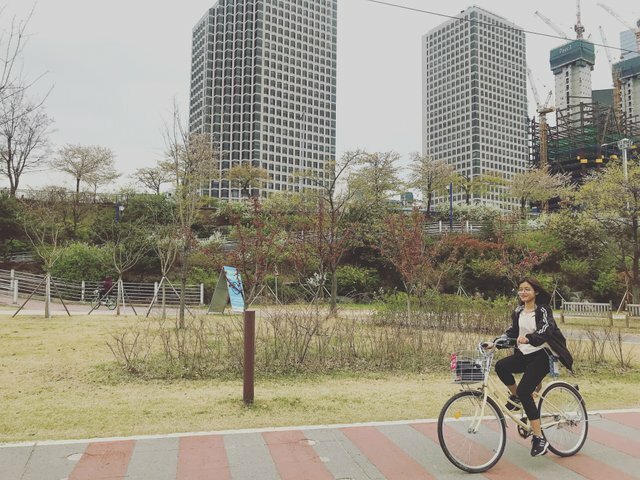 Whenever someone asked me about Seoul, I always described it with a word - "peaceful", because I was so impressed by the image of Seoul with people camping and cycling along the Han River. It is really a beautiful and peaceful scenery rarely seen in one of the most developed cities in Asia such as Seoul. Rent a bike nearby for a reasonable price then take a ride while watching the cherry blossoms, breathe deeply and picture pleasant air of late spring filling your lungs. I did spend the whole afternoon to relax on the Han River and it became the most unforgettable memory of mine in this adorable city. If you are a true fan of Korean dramas, this place must be no stranger to you. By appearing many times in movies as well as TV shows, Namsan Tower is known as a romantic and ideal dating place for young couples in Seoul. Namsan Tower is the place that has thousands of love locks. If Europe has a love bridge in France, Asia also has Namsan Tower in Korea. The lovebirds come here and leave locked locks showing their names with the hope that their love will last forever. I don't believe it actually but I love to see thousands of people's love hanged over there. Namsan means "western mountain", the Tower is located on the top of the mountain. There are two ways for you to climb up. 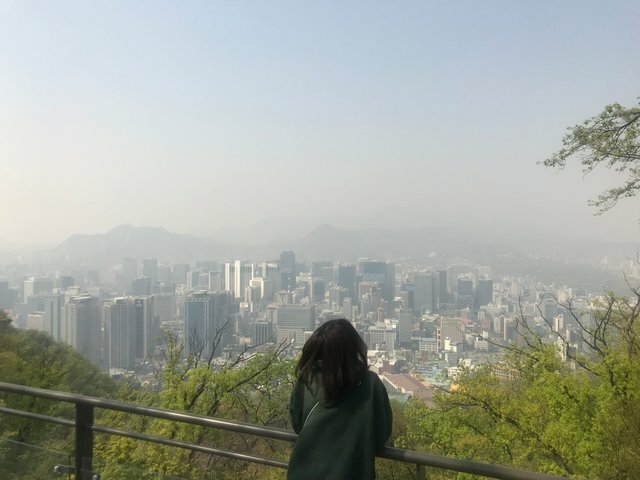 You can take a bus at the foot of the mountain then it will take you there after 15 minutes, and another way is just take a hike and enjoy the beautiful landscape of Namsan, but it may take long time to get on the top (I dont know, since I didn't try. But there were a lot of people go by walk, so it seems not bad). I took a bus to go there, and from the last station to the Tower, I still need to take a short walk. Do you know what is the most beautiful here? 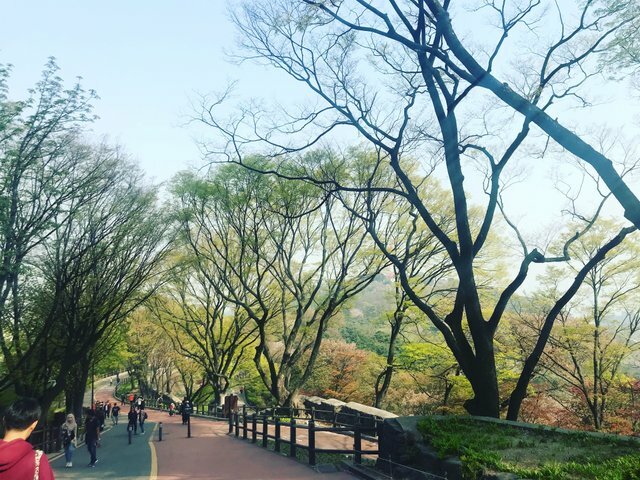 It is not about the Tower or love locks, but a 10-minute walk to the top of Namsan. The rows of greenery, cherry blossom petals falling in the spring breeze, tulips blooms along the way. What an ideal scene in Korean dramas. And the whole beautiful city bellow will be in your sight as soon as you reach the end of this way. I always highly appreciate the way Korean government spreading their culture and promoting tourism. 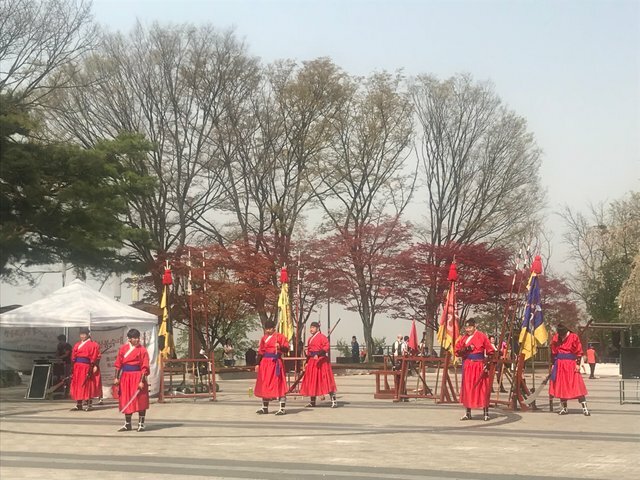 They hold a parade with traditional costumes at the Gyeongbokgung Palace every day, they appoint volunteers to walk around tourist attractions, wearing red shirts with the big text "INFORMATION" and showing all the languages they could speak in their back, so tourists could seek help or guide for free. 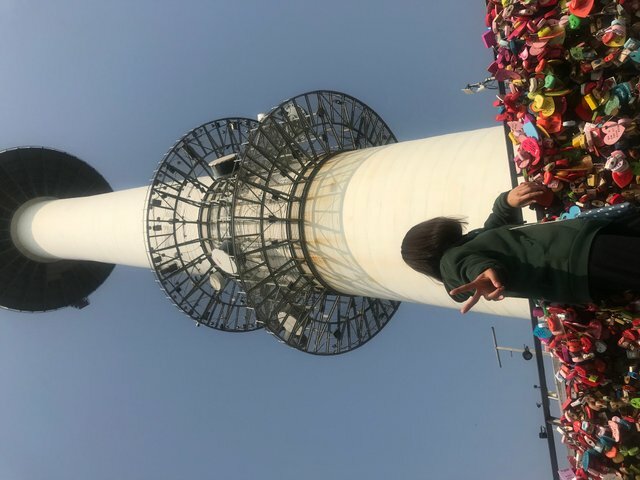 And at Namsan Tower, they hold Korean conventional arts performance such as performing traditional instruments, martial arts. It is always surrounded by tourists. We enjoy their culture, and Korean government achieves their purpose. Kangnam is known as the richest, most developed and most expensive area in Seoul. 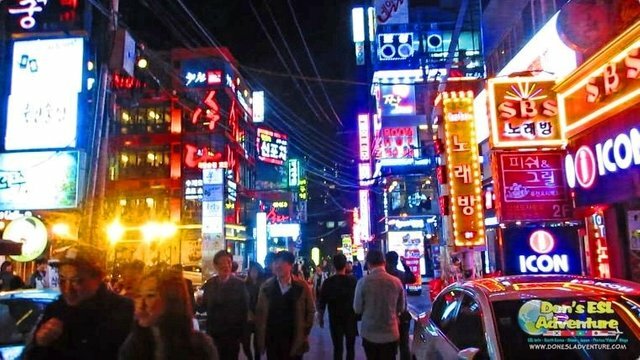 If you want to enjoy the nightlife of Seoul, Kangnam is where you have to go. Indeed. The crowded restaurants that never closes, the streets that are still full of pedestrians eventhough it’s over midnight. Feeling like this is place that most people are night owls. Kangnam is where you need to go to actually see a Seoul that never sleeps. When traveling to any country, I always visit traditional markets, or local business places. To me, these are the places where I can enjoy the most local culture, as well as discover the most original cuisine. Gwangjiang Market, formerly Dongdaemun, seems to be a perfect choice in Seoul for my travel style. Gwangjang Market is known as one of the oldest and largest traditional markets in South Korea. Once you enter the market, you will be overwhelmed with the number of visitors and countless choices of food. 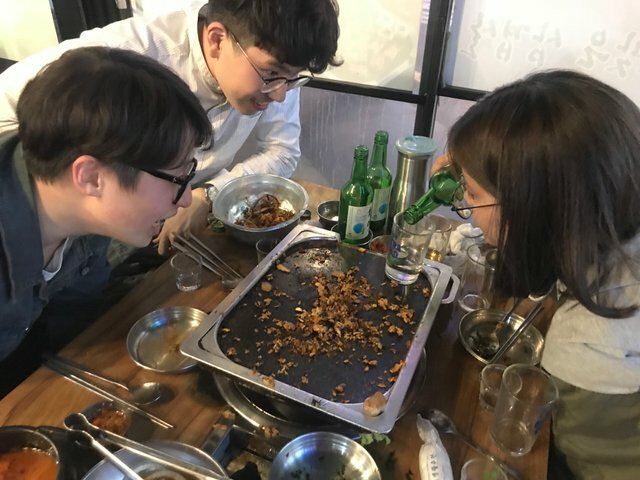 If you are looking for typical Korean food, here is genuinely paradise for you: Kimbab, tokbokki, sundae, kimchi, odeng,... Korean cuisine is all here. All what you need to do is preapre money, an empty stomach and expect that there will be an unstopable food exploring journey. 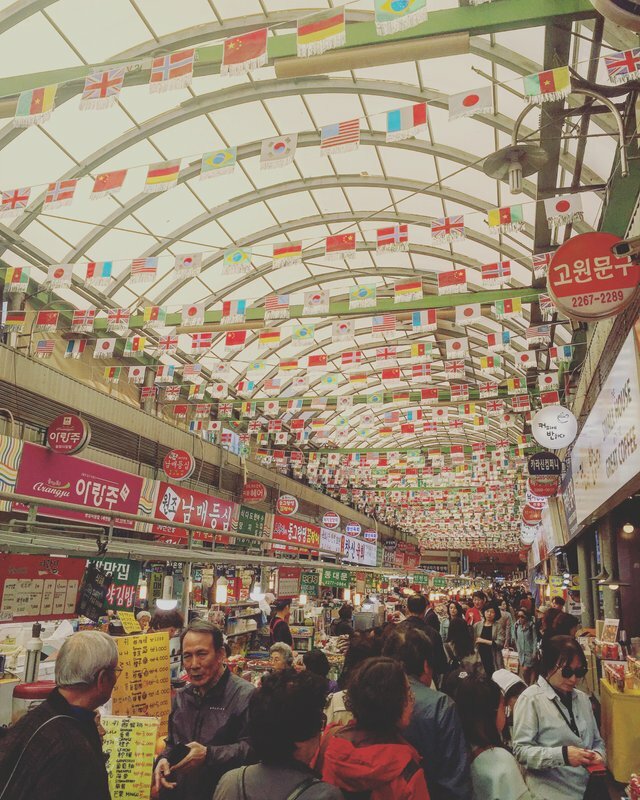 There are thousands of people visit Gwangjang Market every day, including local people and tourists, but most of them is Japanese and Chinese. Do you know what Japanese looking for here? It is Sannakji - alive octopus. You may feel disgusting about this dish. But with Korean and Japanese, it is an amazing food. Gwangjang market is well-known for this one. I also went for it. But I gave up right away after I saw the four japanese in the next table trying to pick alive octopuses on the dish. It is really hard experience. Indeed. Raw beef is also famous here, it is quite nice. I did try it. 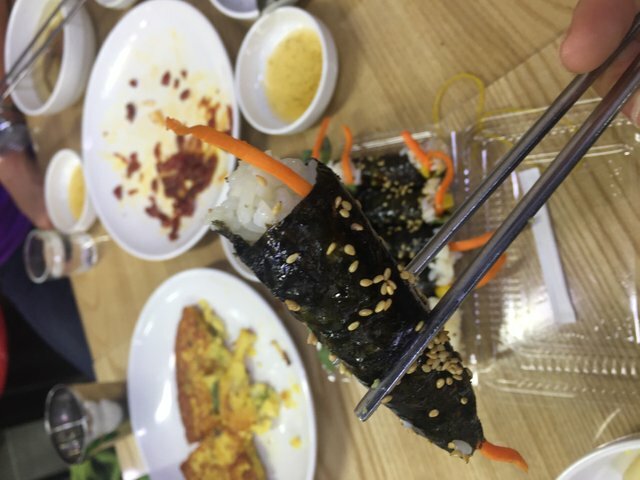 My friend warned that the Mayak Kimbab - the special kimbab in this market, can make me addicted. It really did. 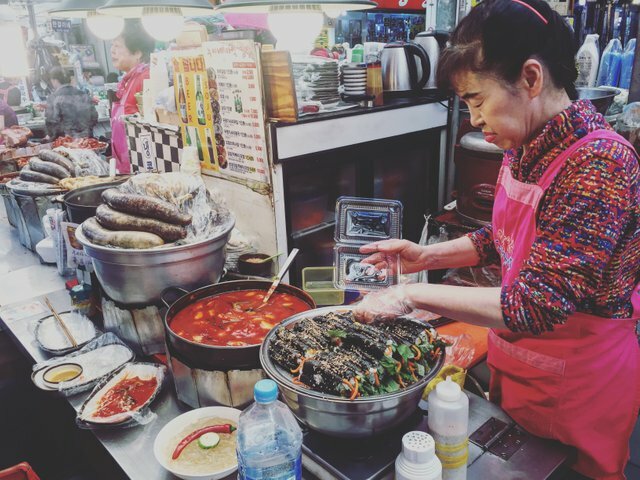 If you have a chance to visit the market, you can skip every food, but Mayak Kimbab is worth trying. Believe that it is a kind of kimbab that I have never had and can’t found out in anywhere else. It is so simple but fabulous. There are many festivals taking place in Seoul every year. Depending on the seasons of the year, there are different festivals such as cherry blossom festival, roses festival, azalea festival, etc. You should seek and update information about such festivals, to not miss one of the interesting activities of the locals, as well as to have an eye-opening visit. 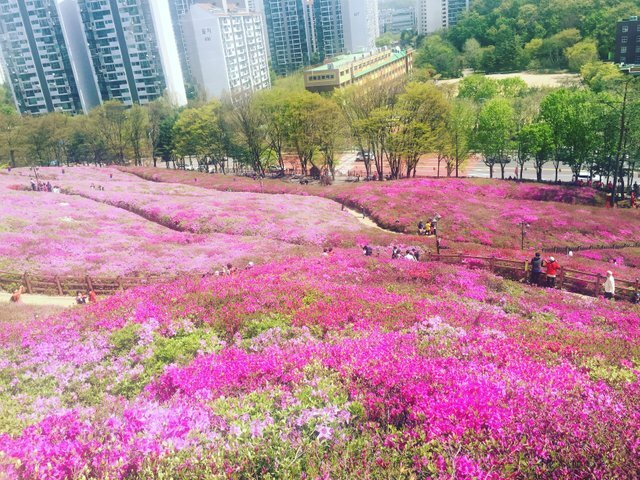 The time I visit Seoul is in April when the azaleas festival is taking place in the suburbs of Seoul. I did not miss the opportunity to join in this brilliant festival. Look at the great pictures I took. The hill was fully covered with azaleas as a giant pink carpet. Not bad, right? Lotte world and Everland are two amusement park. Really fun with too many games. You can buy ticket and stay inside whole day. But be aware that it is really crowded in weekend and you need to line up for a hot game about 2 hours and play it just 5mins (crazy, right? But, yeah, I did). 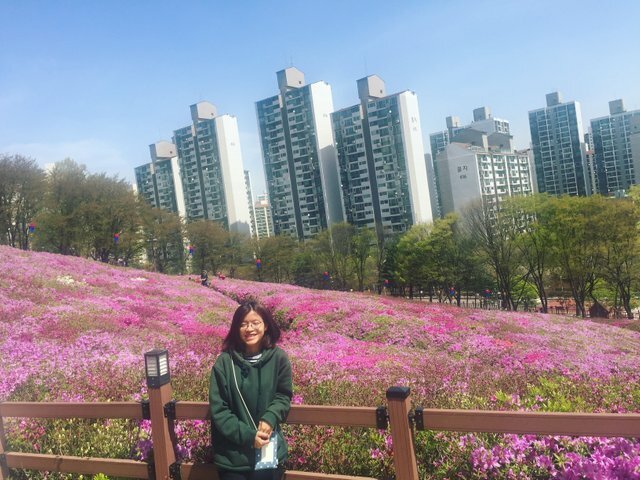 Hope my posts of “Seoul Attractions: Where to go?” can help a bit for your Seoul trip. Next one will be “What to eat?”. Woah! So many blossoms! And those cherry trees! I love when those blossoms fall, it looks like snow! We saw the Cherry Blossoms there one time in Busan. Our neighborhood was famous for a street full of them. Near Gwangali Beach. Your UA account score is currently 3.531 which ranks you at #6095 across all Steem accounts. Your rank has improved 147 places in the last three days (old rank 6242). In our last Algorithmic Curation Round, consisting of 490 contributions, your post is ranked at #134. This is new post but old trip. Too lazy so eventhough I’ve come back Vietnam for 6 months already, my post still stucks in Korea. Haha. I’m trying to move to Thailand trip in the last June.